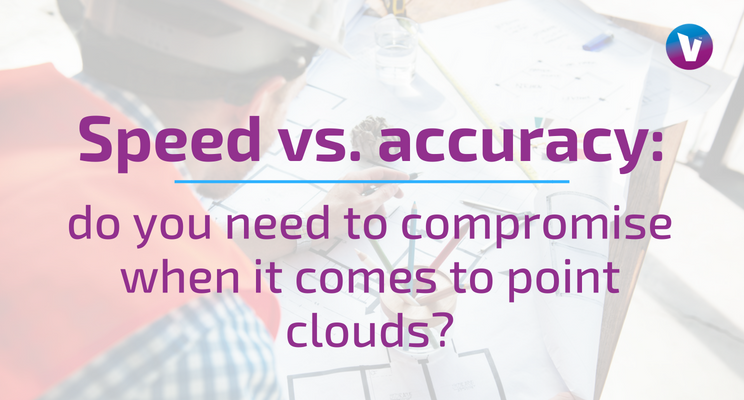 Speed vs. accuracy: Compromise when it comes to point clouds? Point cloud modelling based on laser scans has always promised to provide a quick and easy means of mapping physical space in great detail. However, this has never quite been true. Although point clouds can deliver impressive detail and accuracy, achieving this requires multiple interoperating pieces of technology and a significant investment of time in manual processes. The level of work required for point cloud generation is particularly intensive when looking to measure a large area that requires numerous scans. Limited measurement of key dimensions is often a faster and cheaper way to proceed to the next stage in a construction project, despite the benefits of 3D modelling derived from laser scanning. Producing an accurate and complete 3D point cloud often requires multiple scans. Laser scanners must make line-of-sight measurements and have a limited accurate range. In order to map an area or object, you must capture enough angles that downstream processing (3D modelling and visualisation) can effectively interpret the gaps. For large projects, multiple scans are required to cover the entire area. The result of a multi-scan survey process is dozens, if not hundreds or thousands, of independent scans. Each is individually accurate but is only a segment of what you want to achieve. In order to produce an accurate point cloud compilation that covers the entire area, you must stitch together the individual scans with the same level of precision that each scan possesses independently. In order to achieve this, a ‘registration’ process is required. 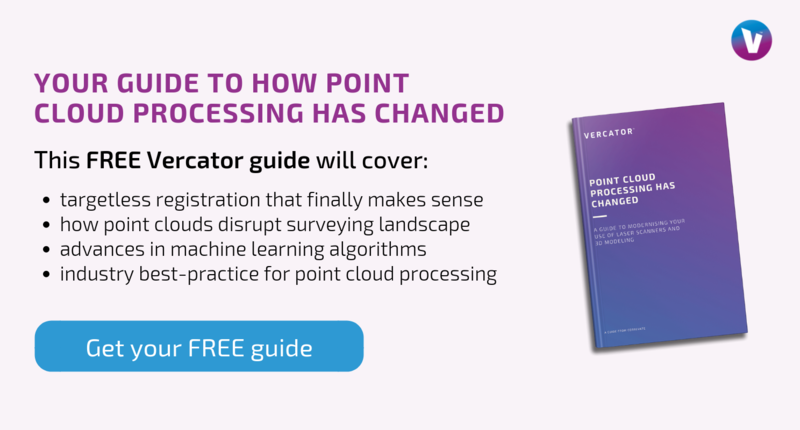 This registration procedure is where the entire point cloud generation process traditionally slows to a crawl due to the limitations of current software. The conventional point cloud registration process includes placing artificial targets in strategic locations around a site. These are either free-standing spheres or chequerboard surface targets. Either way, they are specially designed point-reducible objects. The targets ‘fix’ each individual scan in a common context of adjacent scans, allowing them to be accurately overlayed to create a complete map. These targets must be manually placed. The manual placing of targets is time-consuming and can be a deceptively complicated process. A minimum of three common targets is generally required for each pair of scans. Surveyors must think about each successive scan in order to achieve appropriate target placement. This is challenging when attempting to scan a complex interior space. For surface targets, subsequent scan angles must also be accommodated. In both enclosed and open areas, target range needs to be considered based on the type of targets, their size, the relative location of the scanner and scan resolution settings. These targets then must remain static. Targetless point cloud registration: a failure? Targetless scanning has always been the hope for a simplified process. This is exactly what it sounds like — the ability to contextually place individual scans within a larger scene without the use of artificial targets. Automatic registration is achieved by the identification and overlay of distinct objects or features within each scan. This can be any geometrically distinct object, such as the corner of a room or doorway, that is covered in both scans. Algorithms are used to compare select zones, or every point in a pair of scans in order to align targetless data. These techniques have been around for some time, but have always come with downsides. The movement of people or objects within a scene will always cause localised distortions and inaccuracies within a scan. Artificial targets prevent those inaccuracies from damaging the integration of that scan into the wider scene, or the accuracy of subsequent scans stacked on this ‘noisy’ data. The precision and accuracy of the map remains tied specifically to your ability to position and identify the static and artificial targets. Targetless scans build on top of each other using the scan data itself — often in aggregate. If the data of any one scan is of poor quality, it can impact the entire model. Taking targetless scans outdoors is where movement most often becomes a problem. For example, scanning a field dominated solely by natural objects, such as trees and shrubs, is still very difficult for targetless registration because of the wind. This can also be an issue in the presence of working heavy machinery, people or moving vehicles. The problem of movement can be overcome in the context of natural stationary points of reference. However, it is only recently that algorithm advancements have made this a repeatedly achievable and accurate outcome. Targetless scans also require a significant amount of overlap in order to be accurately registered. A small access room or stairwell, for example, could present a challenge when attempting to accurately stitch that scan together with an adjacent room. This issue is true of targeted scans as well, it is simply more easily avoided through strategic placement of artificial targets. The necessity for high overlap between targetless scans is the source of its second long-standing failure — paying for time saved in the field with time spent in the office. Traditional targetless registration requires up to 60% overlap in order to ensure accurate alignment. Advanced modern systems have lowered the requirement to 30%. Even if required to take more scans, surveyors save a significant amount of time in the field through bypassing the need to make delicate target placements. The problem is the amount of time it takes to process that increased amount of data. This issue is amplified by the fact that, for most systems, it takes more time per scan for software to identify common natural features than artificial targets. The real problem, however, is that traditional software used for targetless registration requires regular manual inputs, demanding constant professional supervision. For example, a 130 scan point cloud dataset of a large building will likely take nearly 25 hours to process. That is at least 3 days of work! The accuracy issue with targetless point cloud generation has always been about removing ‘noise’ from scans and aligning adjacent point clouds based on stable geometric features. Improvements in algorithms have greatly increased the ability to do this automatically. Under certain circumstances, targetless scans can achieve increased precision, particularly when operating in optimised environments. For example, natural features that include the stable intersection of multiple straight lines lock x, y, and z axes. Using targetless registration to scan an enclosed angular room will deliver a hyper-accurate composite image because there will be millions of point overlaps and clear angular features. Surveyors need to think about the surrounding area whilst scanning. The necessity to look out for stable natural features and attempt to overlay them in subsequent scans from multiple angles, however, introduces several of the time-consuming pitfalls of targeted registration into the targetless environment. 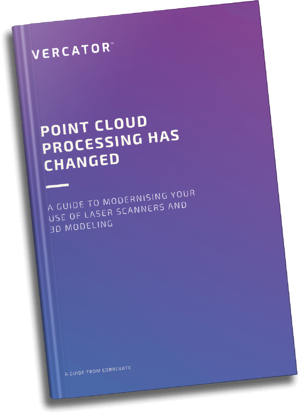 Any hope of improved efficiency for targetless scanning is pinned on improvements to point cloud processing and alignment. What has been missing to solve the problem of point cloud accuracy at speed is automated processing software. If we are able to remove the need to be manually involved in the registration and alignment process, the problem created by needing to make additional scans for targetless registration will be significantly mitigated. One of the steps that forces constant manual interaction with point cloud processing is setting defined search areas for algorithmic feature detection between scans. This is required to save overall processing time. But, there is a better way. Vector analysis, rather than simple point comparison, allows for more accurate scan pairing and faster methods of analysis. The positional data of a scanner can be used to extrapolate each point into a directional vector with a normalised length of 1 unit. This allows each vector to be lifted from its original context and an entire point cloud to be collapsed into a single point. The unique characteristics and identity of that scan, however, are retained in the nature and density of the directional vectors branching off from that single point. Because these vectors are all normalised to a unit length of 1, each scan creates a unique sphere. These spheres are defined by the millions of uniquely angled vectors that make up its surface and volume, and previously constituted the point cloud. This enables the rapid rotational alignment of adjacent scans through placing the spherical representation of each scan inside one another. With sufficient overlap, the commonalities between the spheres will enable their alignment via rotational analysis. This spherical analysis then allows for separate and rapid 2D point density alignments on the horizontal and vertical axes. This multi-stage process drastically improves the speed at which scans can be aligned. This removes the need to set parameters for scan comparisons, removing the need for most manual oversight. Advances in point cloud processing have empowered targetless point cloud registration, creating robust solutions that can deliver significant reductions in the time and cost of 3D modelling. Primarily, point cloud creators now have the ability to queue scans for out-of-work hours or overnight analysis and alignment as a result of automation. New techniques in vector-based spherical alignment and 2D point density calculations have further reduced the total time taken to align scans. A 28 scan dataset, for example, can now be processed in about an hour. This scales down in efficiency as the total number of files increases. However, most large-scale projects will receive a 40%-70% improvement in alignment processing speed. Combined with automation, this not only means that point cloud creators can queue scans for unsupervised alignments, it means that many projects can be finished in a day. There is no longer a need to weigh time saved in the field against time spent processing in the office. In fact, the speed of processing has created the possibility of onsite registration and alignment of targetless scans. A 12 scan file of a meeting room can now be processed in 8 minutes — a 90% reduction from traditional processing time. Targetless registrations using a vector-powered method are able to achieve a scan-to-scan RMS (Root Mean Square) error of +/-3.2mm. This figure is within the laser scanner measurement accuracy of +/-2.0mm. This level of accuracy, combined with automated and accelerated processing, has made targetless registration the new best practice for 3D modelling and point cloud generation.